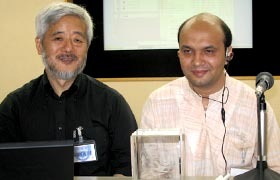 DAISY for all conference in Tokyo Japan Mr. Vashkar bhattacharjee programme officer of YPSA and Focal person DAISY for all in Bangladesh have attendant in the Conference. The Conference was organized by the DAISY Consortium and the host organization in Japan was ATDO and Nippon Foundation. The conference was for final reporting and planning for future action of the DAISY For All Project. Representatives of DFA Focal points attended in the Conference. The Conference was held on from July 28 till August 1, 2008.